the cup-shaped cavity on the lateral surface of the hip bone in which the head of the femur articulates. Acetabulum, showing the cup-shaped cavity (A), and its articulation with the femur (B). From Dorland's, 2000. A cup-shaped depression on the external surface of the hip bone, with which the head of the femur articulates. /ac·e·tab·u·lum/ (as″ĕ-tab´u-lum) pl. 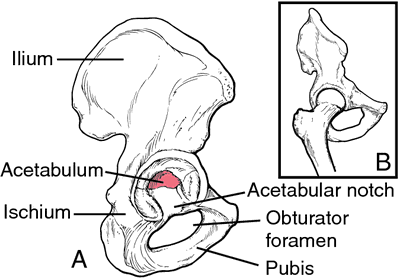 aceta´bula [L.] the cup-shaped cavity on the lateral surface of the hip bone, receiving the head of the femur. the large, cup-shaped cavity at the juncture and lateral surface of the ilium, the ischium, and the pubis, in which the ball-shaped head of the femur articulates. A deep semispherical socket cavity in the lateral surface of the hip, with which the femoral head articulates, located at the convergence of the ilium, ischium, and pubis. The acetabulum is functionally comprised of two columns (anterior and posterior) and two walls (anterior and posterior). The socket in the side of the bony pelvis into which the spherical head of the thigh bone (FEMUR) fits. 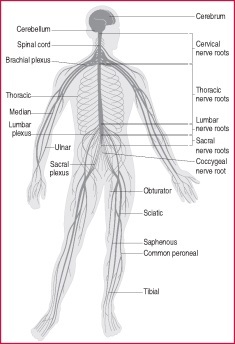 The word is derived from the Latin acetum , vinegar and abulum , the diminutive of abrum , a container. The acetabulum was thought to resemble a small vinegar cup. one of two cup-shaped sockets in the PELVIC GIRDLE articulating with the ball of the FEMUR. The large cup-shaped cavity at the junction of pelvis and femur or thigh bone. (from the Latin for a vinegar-cup) the cup-shaped cavity on each side of the pelvis into which the head of the femur fits, forming the 'ball-and-socket' of the hip joint. 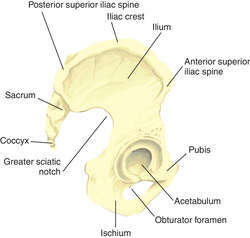 Figure 1.
n the bowl-shaped cavity that houses the rounded tip of the femur, where the ischium, pubis, and ilium join. n a cup-shaped attachment site located laterally on the hip bone for the head of the femur. the cup-shaped socket of the hip joint that receives the head of the femur. See also acetabular. in Dole horses; clinically normal at birth, osteoarthritis and round ligament disruption develop later. 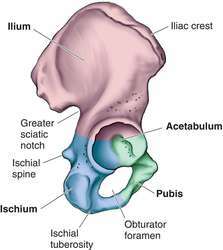 Acetabulum was elliptical or oval opening ventrally. As the fracture in Type-IV concomitant acetabulum fracture, it is difficult to maintain the state of reduction after traction, and cartilage degeneration and joint stiffness may occur if joint is fixed for a long time. 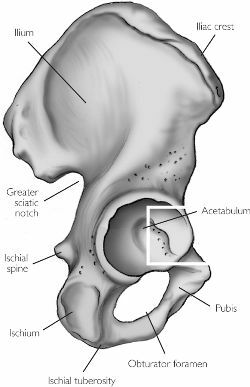 It always located between the acetabulum and the femoral head and connected to the labrum. d) Axial computed tomography showing fracture of the femoral head and posterior wall of the acetabulum. Poorly developed acetabulum is observed and evidenced on the left side (figure 1). Analysis of fracture behaviour of the cement mantle of reconstructed acetabulum, Computational Materials Science 44: 1291-1295. It is characterized by early pathologic contact during hip joint motion between skeletal prominences of the acetabulum and the femur that limits the physiologic range of motion of the hip-typically flexion and internal rotation. also reported dislocation from the native acetabulum following hemiarthroplasty in 1. Developmental changes in the femur and acetabulum in spastic paraplegia and diplegia. The hip joint is normally very sturdy because of the fit between the femoral head and acetabulum as well as strong ligaments and tendons at the joint which provide it with stability. Orthopedic/sports medicine: the hip joint: do you really need it replaced? Body elongate, narrow, parallel lateral margins, extremities round with maximum width at acetabulum level or just pre-acetabular (Figs 1A, 2B).